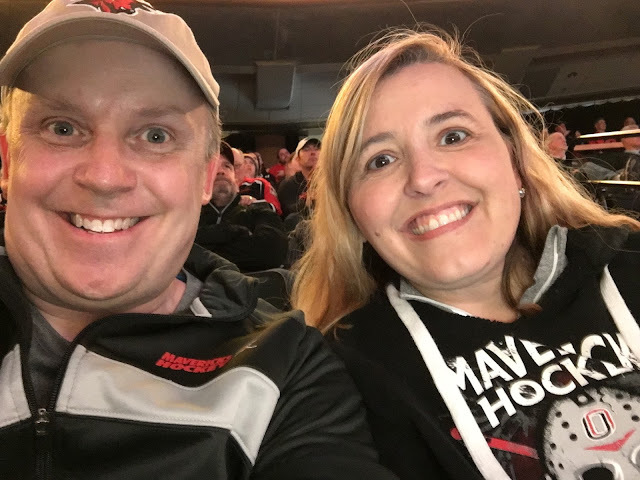 Bridget and I have been fortunate to be able to go on a lot of hockey road trips. 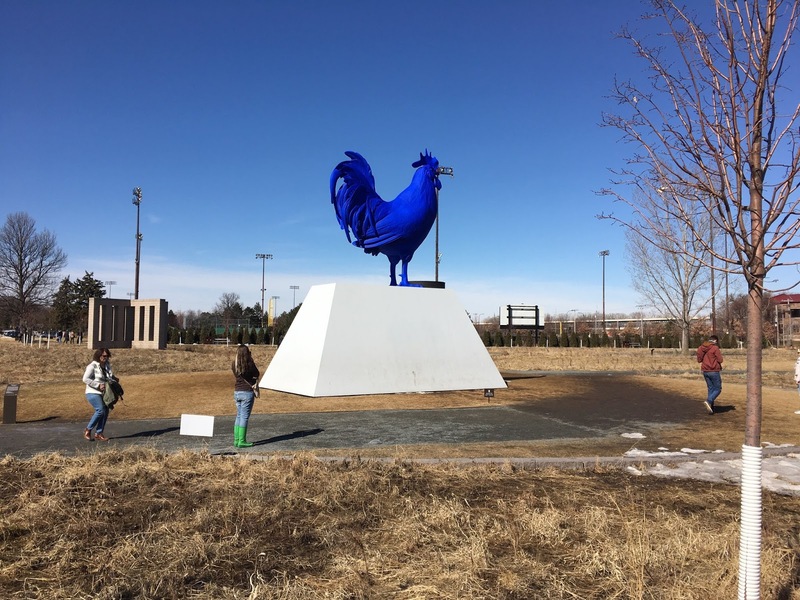 As you can imagine, most of those trips have been in support of the University of Nebraska at Omaha Hockey program in various road series and postseason tournaments. 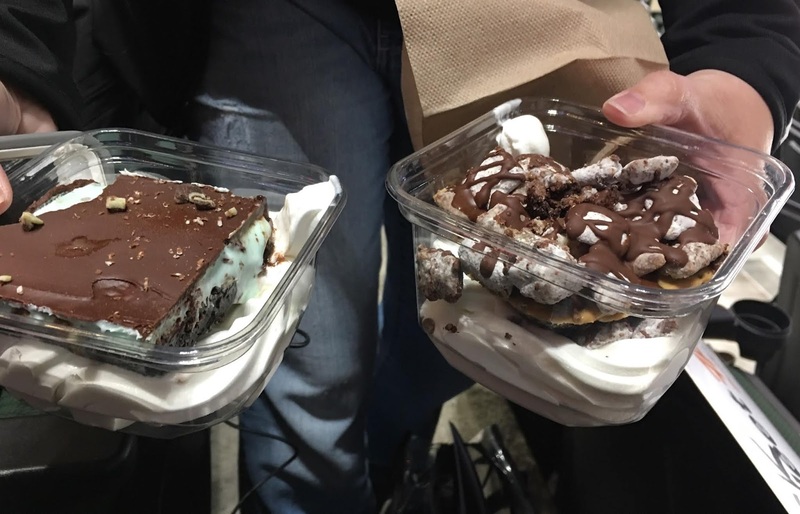 But some of our favorite hockey-related trips have been those that didn’t involve the Mavericks at all. 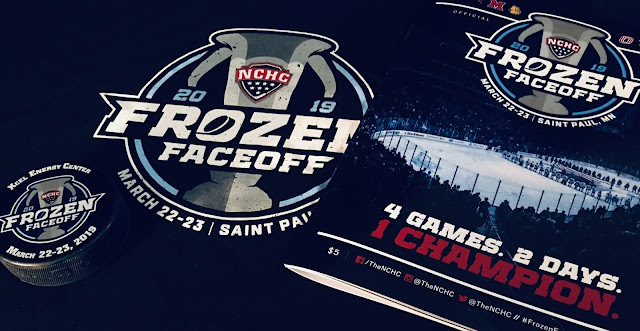 It is in that spirit that we traveled to the 2019 NCHC Frozen Faceoff on March 22-23 in St. Paul, Minn. The last time we attended a neutral-site conference championship event was the 2005 CCHA Super 6 in Detroit. 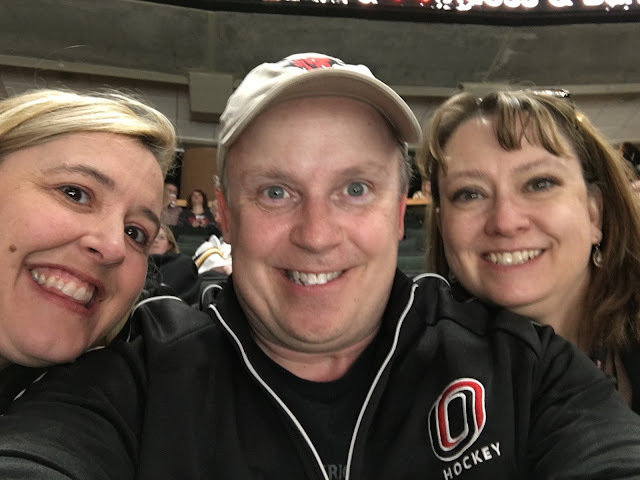 Like many UNO Hockey fans, we figured we’d wait to attend the NCHC Frozen Faceoff until the Mavs made it to the conference finals. That sentiment changed when we won a free pair of tickets from UNO to this year’s event. 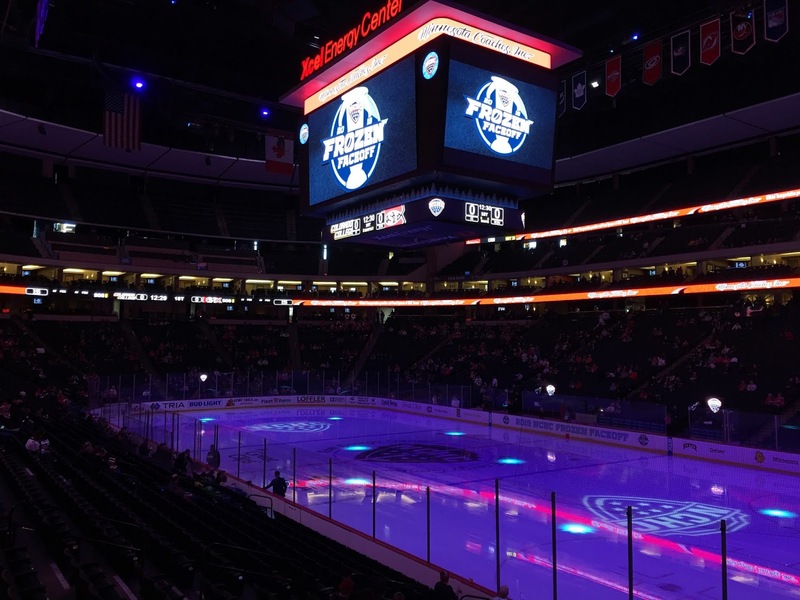 The NCHC Frozen Faceoff is held at the Xcel Energy Center in downtown St. Paul. 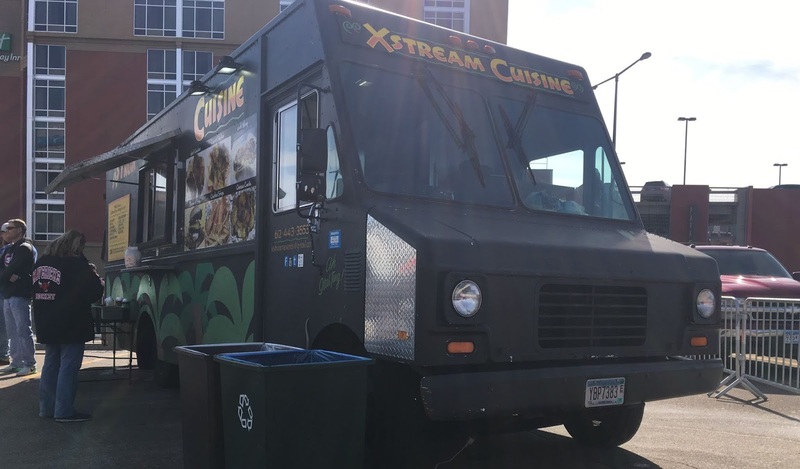 The venue is the home of the Minnesota Wild. 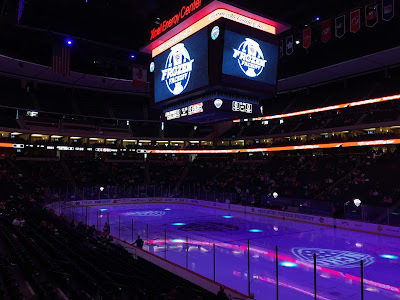 We have a number of friends who have attended Wild games and the Minnesota boys high school hockey tournament at the venue. 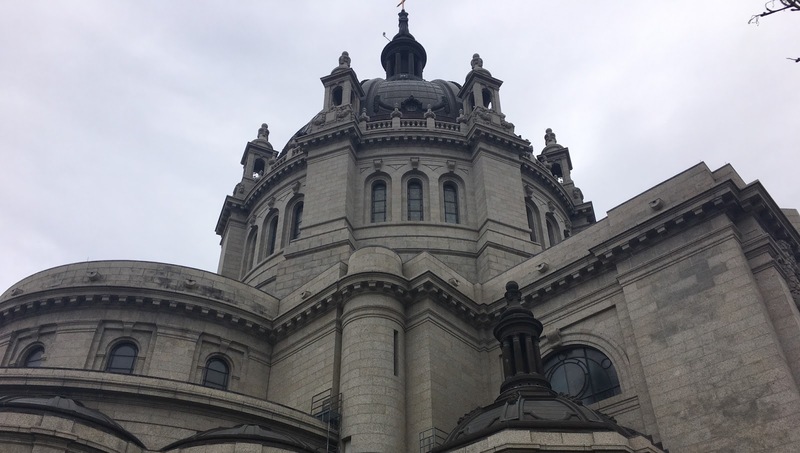 We drove up to St. Paul on the 21st, and settled into our hotel (which was within reasonable walking distance from the venue). 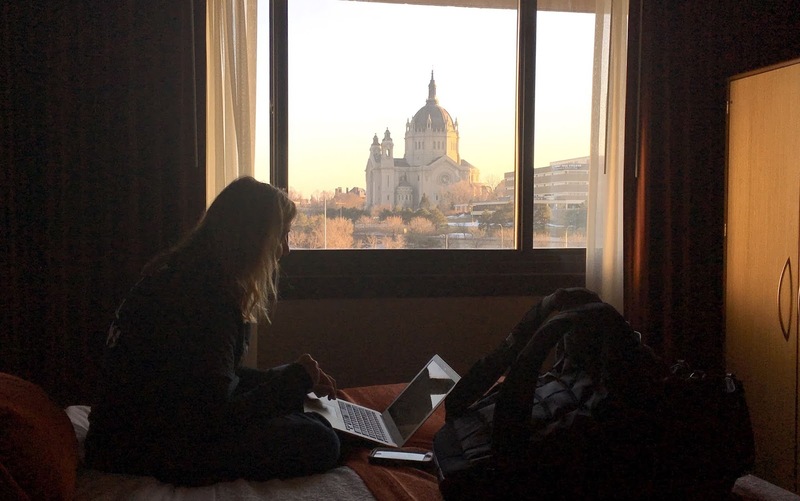 Our room looked out onto the gorgeous Cathedral of St. Paul (more on that later). The NCHC Frozen Faceoff is a 4-team/4-game format with two semifinal games on Friday, and a consolation and championship game on Saturday. As a result, we had some time to do other activities before the late afternoon start times. 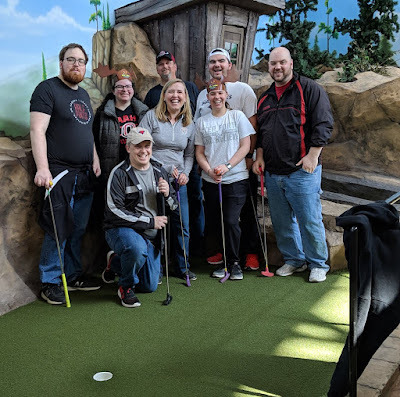 It took us a surprisingly long time to get through 18 holes of mini-golf, but it was really fun to get to hang out with Chris, Connor, Chuck, Brent, Alexis, and Riley. Brent has mentioned a number of times on Twitter and Facebook how he has made a trip to the NCHC Frozen Faceoff an annual tradition since the conference started play in 2013. Bridget and I ate lunch at “Melt,” in one of the Mall of America’s food court areas. 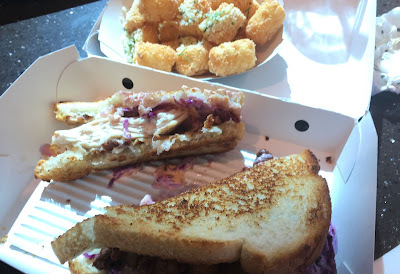 I had a melt that consisted of sourdough bread, a fried chicken breast, and red cole slaw. 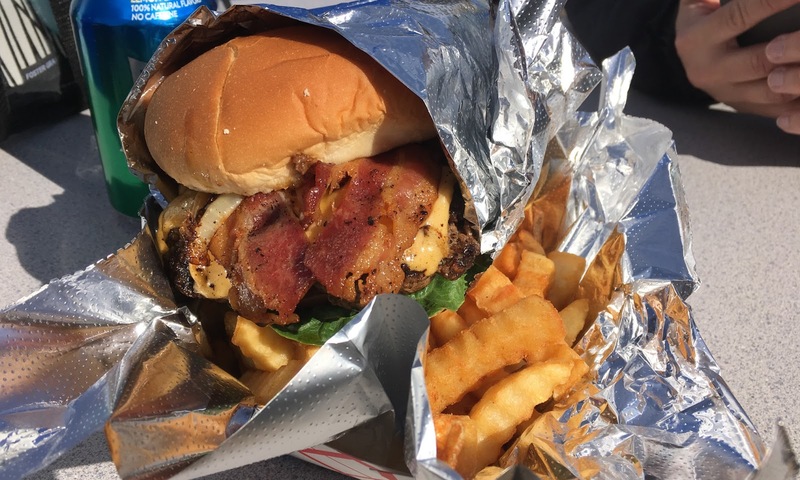 It was good (although a bit too much slaw for my taste). We did a little more shopping at LEGO and the Apple Store before trekking back to St. Paul for the 4 p.m. match at the NCHC Frozen Faceoff. The weather was lovely, so we walked the approximately 1 mile to the arena from our hotel. Bridget and I have now been to four NHL venues. The Xcel Energy Center is one of the best. 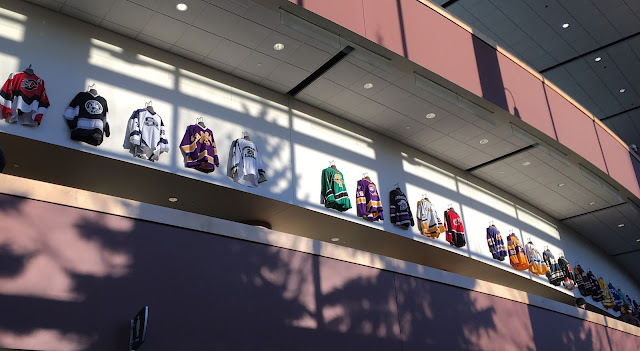 Around the arena (particularly on the club level), there are jerseys displayed from Minnesota state high school hockey teams. The venue also has a Hobey Baker display. Top seed St. Cloud defeated Colorado College 5-2 in the early game — ending a surprise run by the Tigers in the conference playoffs. 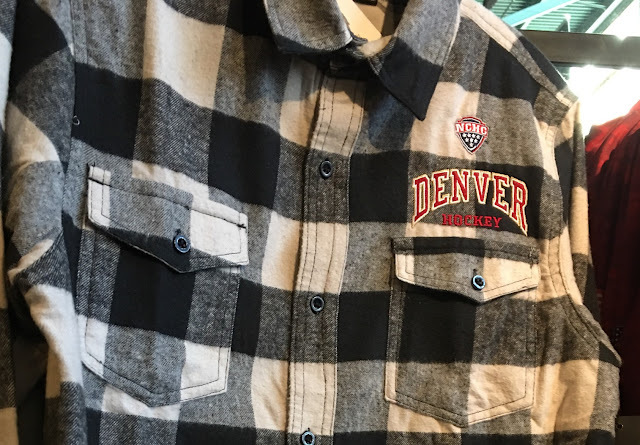 I ended up buying a black Frozen Faceoff t-shirt. 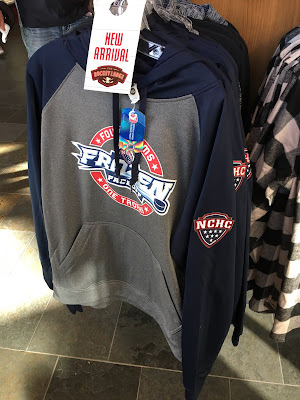 After our nine-mile jaunt to the sculpture garden, Bridget and I made our way back to the hotel for a quick nap, then we strolled over to the “fan fest” before the 3:30 p.m. “third place” game at the NCHC Frozen Faceoff. 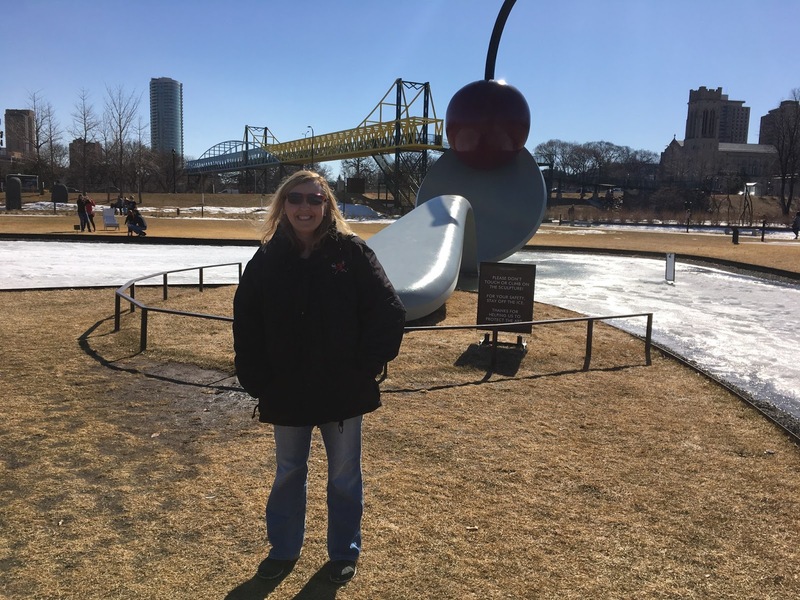 When we decided to travel up for the NCHC Frozen Faceoff, Bridget was hoping to have the opportunity to meet Verna Toller — the Business Operations Manager for the NCHC. We’ve corresponded with her on Twitter over the past few years, but had never met. We were both happy to have the opportunity to meet her on Saturday afternoon at the Xcel Energy Center. Hockey fans often refer to the NCHC as “the best conference” in college hockey. 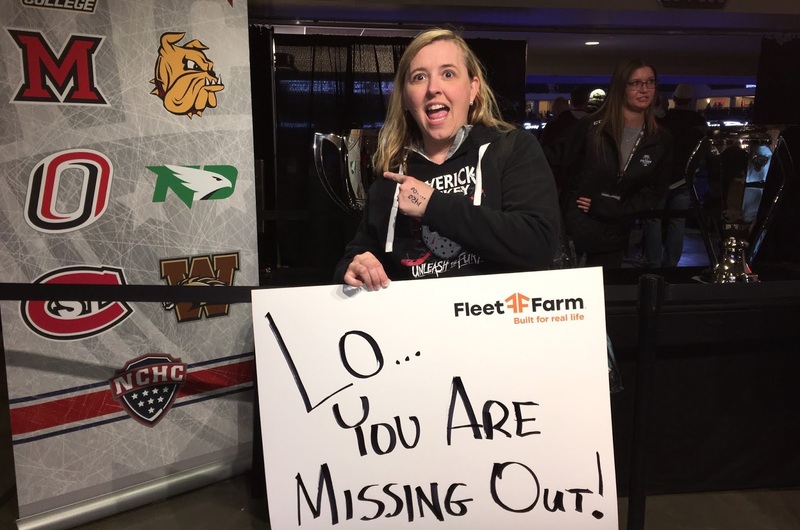 The reality is that a great tournament like the NCHC Frozen Faceoff needs great people working behind the scenes to get the job done. Toller is one of the fine people who keeps the NCHC running like a well-oiled machine. We chatted with her for about 20 minutes. It’s nice to have a chance at these events to meet some of the people we interact with on Twitter each season. Bridget and I are both thankful she had some time for us! 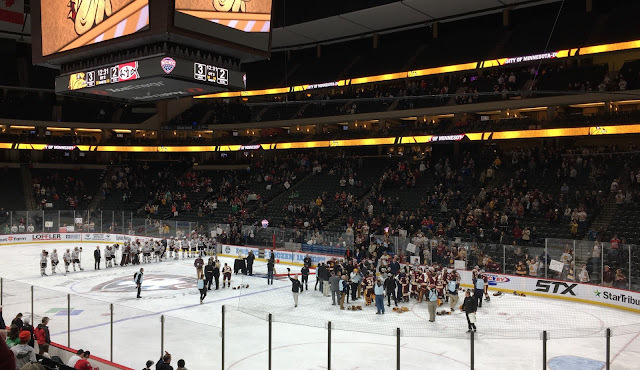 The championship game featured the NCHC’s top two seeds — St. Cloud State and Minnesota-Duluth. The game lived up to the billing. As expected, both Minnesota schools had strong fan representation in the arena, and the atmosphere was electric. The heroics on the ice were exciting, and the game went to not one, but two overtime periods. It ended after 11 p.m. local time. 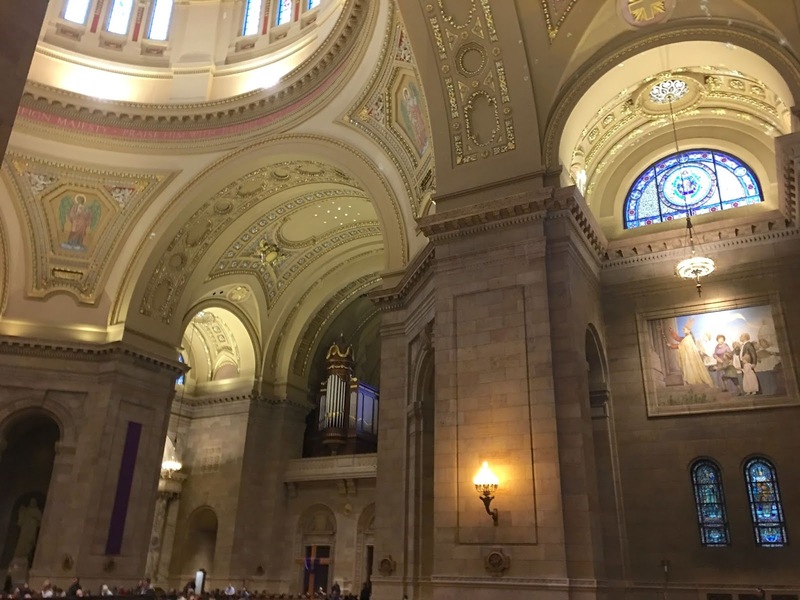 Because the game went late, we didn’t get to bed until around 12:45 a.m. As a result, my plan to attend Mass with Bridget at the Cathedral of St. Paul went awry. 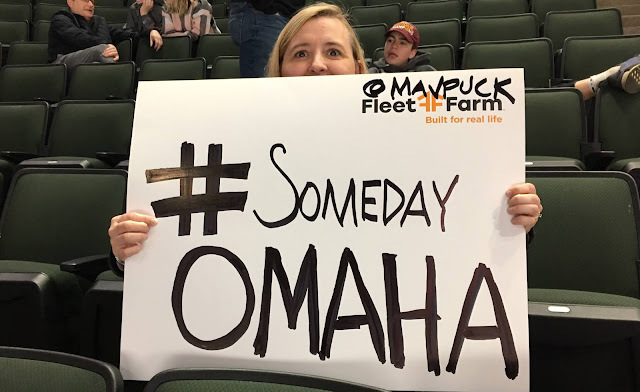 As I mentioned earlier, we have a number of UNO Hockey friends who make the trip up to St. Paul for the NCHC Frozen Faceoff on a perennial basis. They kept telling us what an enjoyable trip it is. If you love watching college hockey like Bridget and I do, the NCHC Frozen Faceoff features the nation’s best collegiate teams competing in one of the finest venues in a hockey-rich state. It is a fun weekend — even if your team isn’t participating. Bridget and I hope to make this an annual tradition.